Newey Roundstone is one of the UK’s largest propagators and producers of protected ornamental plants. They lead the way in the introduction of innovative growing systems, mechanisation, technology and quality management systems. 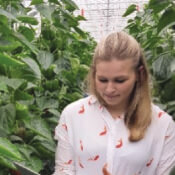 Using live data and collaboration features with 30MHz technology, the company is optimising environmental conditions and constantly improving its IPM strategy, including the understanding and prevention of pansy mottle syndrome. Read the two-part interview with Chris Need on fighting pansy mottle syndrome at Newey Roundstone here and here.